Discussion in 'A Small Circle of Friends: The Music Forum' started by Harry, Jan 17, 2009. They love Chris Montez like a son down at Herbie's place on Sunset Strip. Well, he's so damn decent, you know; so very agreeable and just a nice young guy. Herbie (Alpert--he has a Grammy factory) and Jerry Moss don't sign people they don't like. That's why A & M is sort of a family label, as well as being rich and all that. So here's Chris Montez, like anyone's favorite child, grinning and polite and shy, making hit records as well as being nice. I first saw the boy on a Beatle tour in Europe, about three hundred years ago and he was good even then. Then I heard this melodious girl's voice singing a pretty song named "Call Me" and thought the jockey said "Miss Montez" and I said to myself -- like you do when you're alone -- "I didn't know she was still around," not having seen her since those old movies with Jon Hall. Of course, it turns out to be Chris Montez, and we all know he's a male, but still it gives he-man disc jockeys something to laugh about even if they do lacquer their hair. Also, "Call Me" was a hit and that's a help. Chris Montez is a very good performer. He has charm, a great sense of music and he started early enough to learn the trade in the middle years of rock 'n' roll when he, in line with everyone else, was recording numbers like: "She's My Rocking Baby." Now, with many tours, several hits (remember "Let's Dance," a million seller and British silver disc winner? ), a London Palladium appearance and substantial song-writing experience behind him, he has made a very delightful album for these light, bright evenings. Gotta love that piano solo on Day By Day. The thing that made Chris Montez lps enjoyable was the arrangements. Chris hardly had an ideal voice, but with great arrangements, I think my mailman could make a good album. I always wondered if any members of Baja or TJB played on the Montez records? I'll vote for DAY BY DAY (yeah, the piano IS great). There are 4 other excellent tunes here... THE MORE I SEE YOU, THERE WILL NEVER BE ANOTHER YOU, THE VERY THOUGHT OF YOU and CALL ME. 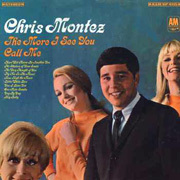 A pretty good first lp for Chris Montez. And it helps that this outing, along with a few non-LP singles, "Go Head On" and "You Can Hurt The One You Love" was not destined to be a one-shot; Chris became ever-lasting...! According to session notes, it was recorded on 2/10/66, The More I See You featured Herb Alpert on trumpet, Chuck Berghofer on bass, Pete Jolly on piano, John Pisano on guitar, Nick Ceroli on drums and Julius Wechter on marimba (vibes). Also recorded in that session was Hey, Baby. It's funny how that thread came up just days before this thread was due. POCM-1951 Japanese CD back cover on booklet. A&M 8524-S The More I See You b/w There Will Never Be Another You Forget Me Nots re-issue 45. A&M 8576-S Call Me b/w Because Of You Forget Me Nots re-issue 45. 9/22/65 - Gold Star Recording Studios - Call Me - Herb Alpert, Nick Ceroli - drums, John Pisano - guitar, Julius Wechter - marimba, Pete Jolly - piano, Donald Peake - guitar, Chuck Berghofer - bass. 2/10/66 - Gold Star Recording Studios - The More I See You, Hey, Baby - Herb Alpert - trumpet, Nick Ceroli - drums, John Pisano - guitar, Julius Wechter - marimba, Pete Jolly - piano, Chuck Berghofer - bass. No further info for this album. Chris' recording of "The More I See You" has the dubious distinction of appearing in the movie FRANTIC with Harrison Ford. There's a scene where Harrison Ford and Emanuelle Seigner go into a club and this song is playing. The young lady mentions that she can't stand the old fogey music! Notice that it doesn't contain the title of "Call Me" underneath "The More I See You", nor is that title included in the list of album songs. My copy contains the "Call Me" title, but is also stereo - this one pictured is a mono version (LP 115). Was it normal for the mono version of this title to not have "Call Me" on its cover? Discogs lists two different LP 115s, bit only has pictures of one, and that includes "Call Me". Meanwhile, why is the song "Call Me" in fake stereo? Was it a mono single added to the album after some pressings? Enquiring minds want to know! I don't trust those databases to have correct cover art--I've got about 55,000+ tracks on my sever and I'd say with at least a third of the albums, maybe closer to half, the cover art had to be corrected or improved. That cover above looks like something a CD reissue would have had in some country. The databases are all pretty sloppy. The freedb used to be the absolute worst; I don't even know (or care) if it exists anymore, as I stopped using it 10 years ago. MP3Tag can use Discogs--it gets close enough to minimize or even eliminate the extra work I have to do. Not perfect but eh, what am I going to do? Even Gracenote isn't perfect, and they are a very pricey pay-to-play database service. Some music players pull from AllMusic (under license), and some of their data is as flawed as their reviews. So yeah, no. Don't chase a dead horse on this one. Wasn't planning to do much chasing, I just wondered if there was perhaps an early version of the album that didn't have "Call Me" on it, and then it perhaps was added after being a hit single, hence the mono recording turned into fake stereo. That kind of stuff was pretty common back then. I'm pretty sure you can hear Herb doing some background vocals on "The More I See You" (during the la-las). "Call Me" was on the album originally. It was actually recorded at RCA, not Gold Star or Sunset Sound, and Bruce Botnick at Sunset mixed these for the mono and stereo albums. Rather than try to leave an odd stereo mix for "Call Me" on the stereo album, Botnick used the mono mix in fake stereo. You can clearly hear Herb saying "Yeah Chris!" on "Call Me" in the channel with the hand clapping in the DCC version (which is the only stereo version of the track--Herb was coaching Chris on the vocals). KentTeffeteller and Bobberman like this. That pretty much answers it sadly Fake stereo was a huge Fad back then. For the stereo album, Botnick likely had the choice to leave it in mono, create fake stereo, or try to recreate the mix in stereo. Parts of the recording (like the crowd and glass clinking noises) were "flown in" when the original mono mix was made, and weren't on the multitrack in other words, as those were a product of the recording as done at RCA. (Bruce also had to liven up the RCA recording as it was dull and lifeless as recorded.) That is why these noises do not appear on the DCC version. Can't do a sample on YouTube due to copyright. If I can do it another way, I'll post it here. The DCC released All-Time Greatest Hits included new mixes for the A&M tracks since the mono and stereo LP mixes were discarded or lost at the time, and the only stereo version existing was the tape sent to the record club (which I guess had added reverb). I like this LP from beginning to end. "The More I See You" and "Call Me" would be my two top tracks. A nice listen anytime. And in general, I love every Chris Montez A&M LP that got issued, and the 45 RPM singles too. Herb is all over Chris' background vocals. A&M knew what they were doing with Chris Montez. More of "Let's Dance" wouldn't have made him as big an attraction as he became at A&M. After a couple of albums, though, they needed a change up, and what followed was, to me, pretty much the same. That's why his career flamed out. He did release a few albums post-A&M (two for CBS, one for A&M International) but I don't think they had the following of his earlier records. Believe that I saw Julius credited as Musical Director for Chris' live performances.